What a great night in the Big 12. I tweeted this out earlier today. Probably the best non-Feast Week night of non-conference basketball for the Big 12 this year. Yesterday, I wrote about how December can be an odd time for college basketball. There’s random games on random nights, often against low-quality competition. That is not the case tonight. We’ve got four GREAT games tonight. I’m going to dive into all four in greater detail below, but first, let’s take a look at how I did against the spread last night. Rough. A real rough night. I went 1-5 on the night and 0-2 in the Big 12. I’m now at .500 for Big 12 picks ATS and under .500 for the season overall. I gotta say, the late three by Northern Illinois against Iowa State to cut it from 17 to 14 in garbage time is why no one should gamble ever (click image to open in new tab). The main takeaway from last night? Trae Young and Lindell Wigginton are quite good and have separated from the pack a bit as the two best freshmen in the Big 12 at this point. That may be a controversial opinion considering Mo Bamba also plays in the Big 12, but I think Lindell Wigginton has done enough over the last five games to put himself ahead of Bamba for that number two spot. I tweeted this out last night, but Wigginton has really hit his stride. Meanwhile, Trae Young had another great night in Oklahoma’s victory over Texas-San Antonio. It’s crazy to say, but you could make an argument he’s been the best freshman in the country, even over Marvin Bagley. I certainly wouldn’t say anyone who picks Bagley would be wrong, but I don’t think any Bagley-backer could criticize someone who preferred Young at this point either. Trae Young with a casual 28/8/5 line tonight. Only 2-11 from 3-point range. Didn’t matter. Young also kept his crazy usage rate pace as he used 41% of possessions for the Sooners. Currently 4th highest in the country at 37%. Let’s dive into tonight’s games. It’s a great slate not only in the Big 12, but nationally as well. 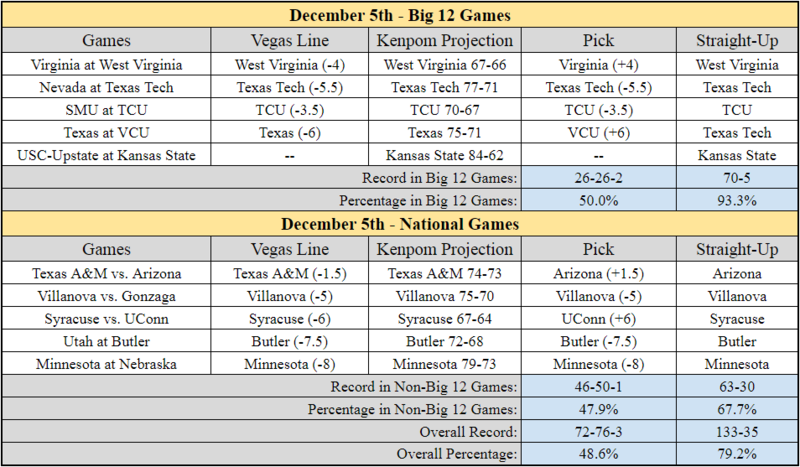 I won’t preview Gonzaga/Villanova or Arizona/Texas A&M as there are enough Big 12 games to focus on, but those games should be really intriguing as well. Here are my picks for tonight. Lines are from VegasInsider and are as up to date as 11:00 AM CST on Tuesday (click image to open in new tab). • Look at all this green in this matchup profile from Kenpom. • This should be a great and potentially simultaneously ugly game between two great defenses in West Virginia and Virginia. Virginia has the best defense according to Kenpom; West Virginia is 11th. However, their defenses are wildly different. • West Virginia is “Press Virginia”, known for high turnover rates, intense ball pressure, and opponents taking quick shots. Virginia is the best pack-line defense in the country, known for slow tempo, forcing defenses into difficult shots from low-percentage areas of the court. West Virginia opponents’ average offensive possession length is 15.1 seconds, 8th quickest in the country. Virginia opponents’ average offensive possession length is 18.6 seconds, 10th slowest in the country. This will be a game between two great, albeit, contrasting styles. • Something to keep an eye on — tempo. Virginia is the 3rd slowest offense in the country, with an average offensive possession length of 20.1 seconds. Will they be sped up by West Virginia’s press? When they break the press, will they look to score quickly or will they set up to run offense and run clock? Whomever dictates this battle could end up being the winner. • I’ll take Virginia to cover but West Virginia to win. I think this should be close throughout and rather low-scoring. • Nevada comes into this game undefeated with an 8-0 record. Their best win thus far is a home win over Rhode Island, 88-81. This will be far-and-away their toughest test this season. • This should be a very fun matchup in the frontcourt, as Zach Smith will face Jordan Caroline and Caleb Martin. Caroline is a legitimate NBA prospect who is currently averaging 18.4 points and 9.1 rebounds. Martin is an NC State transfer who is averaging 19.0 points, 5.4 rebounds, and 2.6 assists. He’s a very talented playmaker. I don’t think Tommy Hamilton or Norense Odiase can guard either of those two guys. Caroline and Martin are too quick for them. • This may be a game where Chris Beard will have to go small and play a more switch-heavy defense. Do not be surprised to see a lineup tonight with Zach Smith as the biggest guy on the court for Texas Tech, surrounded by a group like Keenan Evans, Jarrett Culver, Zhaire Smith, and Justin Gray. That’s a lineup that could counter Nevada’s athleticism and offensive versatility. • I’ll take Texas Tech to cover the 5.5 points at home, but I don’t feel great about it. This should be a really fun game between two athletic teams. • I hate to be basic here, but this should just be a really fun, compelling game. These are two very good offenses — TCU is 18th in Kenpom, SMU is 41st. The backcourts are both very good — TCU has Jaylen Fisher, Desmond Bane, and Alex Robinson; SMU has Shake Milton, Jimmy Whitt, and Ben Emelogu. • An important thing to watch in this one will be the rebounding battle when SMU has the ball. SMU is the 26th best offensive rebounding team in the country, with an Off. Rebounding Rate of 36.6%. TCU is currently the best team in the nation at preventing their opponents from grabbing offensive rebounds, as their opponents only grab 18.6% of their own misses. Who wins this battle? If SMU only grabs around 20% of their own misses, TCU could be in good shape. • I’m taking TCU to win and cover. This is mostly just based on them being at home. If the Horned Frogs win this one, there’s a very real chance they enter conference play on December 30th against Oklahoma undefeated. • Shaka Smart’s return to Richmond, Virginia to face VCU is just a terrific non-conference game to see in December. Kudos to Smart and Texas for scheduling this. It’s incredibly intriguing. • Texas’ defense is currently suffocating opponents. They have the 6th best Adjusted Defense, per Kenpom, allowing 90.0 points per 100 possessions. Opponents are shooting just 43% on 2-point attempts, which puts Texas’ 2-point defense at 30th in the country. The Longhorns are blocking 16.8% of their opponents’ 2-point shot attempts, which ranks 15th nationally. Unsurprisingly, Mohamed Bamba is the main reason why as he is blocking 16.7% of 2-pointers when he is on the floor. That is the 6th best Block Rate among all players nationally, per Kenpom. • VCU is going to have to find ways to score, and the perimeter may be their best option. They are shooting 41.1% on 3-pointers this season, which ranks 27th nationally. I’ll say they hit enough 3-pointers and the crowd has enough of an impact to keep this one close. I’ll take VCU to keep it within 6.